Clear skies. Low 56F. Winds ESE at 5 to 10 mph..
Ira and Alice "Bunny" Walker with their infant son - now the co-author of "Contrary Creek" - ride on the JV Bar Ranch around 1943. In 1957, the family moved on to another ranch in Arizona's Mogollon Rim country. Tom Walker, now a Tucson resident, was born on the family's ranch near Wickenburg. Says Walker: "I miss the quiet." They grew up poor, roping and riding on ranches that have long ceased to exist. Ah, but they still do in the fertile minds of brother and sister Tom and Mary Walker, authors of the just-published "Contrary Creek." Though tagged as a novel, the book is really a tender tribute to the rhythms of ranch life that could only be written by those who lived it. "It's a real beautiful way of life," says Tom, 68, who lives in Tucson and retired from the Star in 2000. "I miss the quiet. I miss the silence." Mary, 64, who now lives in California, also aches for that life. "I had one letter from my father. He wrote, 'Don't ever forget you are an Arizona cowgirl.' I don't." The make-believe Rafter C Ranch, where the fictional Cloud family lived in the early 1960s, is as remote as the ranches where the Walker "kids" grew up. But much of the book's plot centers on the nearby town of Faraway - and a cast of characters too vivid to ever wear the pallid description of "colorful." Then there's the general store. Excerpt: "You didn't shop in Fortner's Store; you explored it like some cave with many levels and passages. Legend had it that a twenty-dollar bill once was found in the pinto beans barrel. No one doubted the story." Teller of this coming-of-age tale is 16-year-old Danny Cloud, who lives on the ranch with his younger sister, B.J., and their parents. Within the span of one year, Danny will bear witness to a book-banning crusade, the arrival of a high school teacher who claims to be a witch, and a series of mysterious deaths. He also will experience true love - and great loss. The book, says Tom, partly grew out of the loss he and Mary felt after their parents, Ira and Alice "Bunny" Walker, died at the relatively young ages of 58 and 60. "My parents were devoted to each other," says Mary. "They rode the open range together, camped out." Ira Walker's dad, A.G. Walker, ranched first in the upper Aravaipa Canyon and later near Wickenburg. By the early 1930s, he was warden of the Arizona State Prison in Florence. But his son was always a cowboy. The ranch where Tom and Mary began their lives was the JV Bar - 36 square miles of leased land north of Wickenburg. Tom's early years were spent in a "barely wood" house that had a tin roof, cracks that let in the chilling winds, no electricity and no indoor plumbing. "The JV Bar had a series of wells scattered around," says Tom. "My job from 12 on was to drive an old Jeep around to these places and start the pumps. We barely had enough water to keep cattle." Mary, like her fictional counterpart, loved being a ranch hand. "I also broke the unofficial state record for barrel racing, I think in 1958," she says. In 1957, Ira Walker sold the JV Bar and with a partner bought the Flying W Ranch, in Mogollon Rim country west of Young. "We packed up everything, including the horses and dogs, and moved to Spring Creek," says Tom. "I was unhappy to be leaving the ranch where I had grown up," says Mary. "I took a can of paint and in huge block letters on the side of the house, wrote, 'This house belongs to the Walkers.' "
The nearest school was in Young, 12 miles from the Flying W, down a rutted road that crossed a frequently flooded Spring Creek. The four-room school served grades one through 12, with the 12 or so high school pupils shunted into one room. When Tom's junior year was over, he, his mother and Mary moved to Globe, so he could finish his senior year there. "You could not go to a university from Young," he says. During the weekends, the family returned to the ranch, where Ira still held forth. In 1962, he sold the Flying W and moved to Globe, where Bunny and Mary still lived while Mary finished high school. "He became a night watchman at the Inspiration Mine. 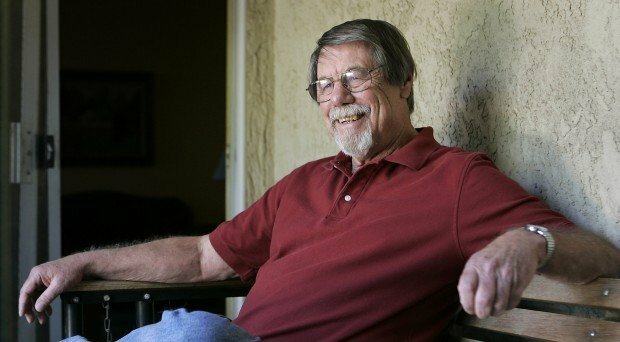 He was miserable," says Mary, who, like Tom, graduated from Arizona State University. 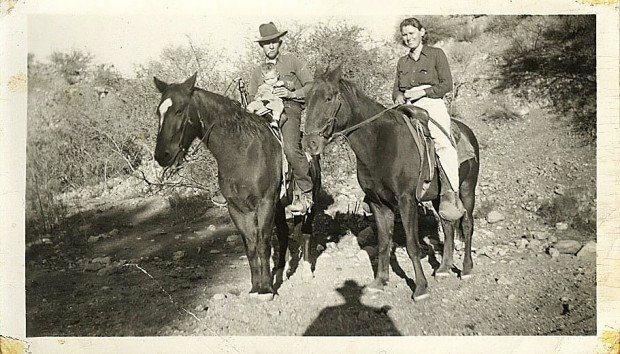 Their parents, says Tom, eventually moved back to Wickenburg, where Ira "leased a small chunk of land and ran 80 head of cattle." Ira died in 1970, Bunny eight years later. "My last ranching chore was to round up the cattle and sell them after he died," says Tom. In the early 1980s, he and Mary wrote a book similar to "Contrary Creek," which sat in a drawer for decades. Two years ago, they took a stab at rewriting it, changing the geography and point of view. Neither the JV Bar nor the Flying W is now a working ranch, says Tom, who with Mary has revisited both, though not lately. "One time when I was at the Flying W, I went in the backyard and dug up the irises my mother had grown and took them back to California," says Mary. "They're still growing. So I have a little bit of the Flying W with me." More than a little bit, I'd say. Reach Bonnie Henry at 573-4179 or at bhenry@azstarnet.com, or write to 4850 S. Park Ave., Tucson, AZ 85714.